People are starting to realise that the world is full of disasters  damage to the environment, weapons of mass destruction, violence, economic collapse, the Middle East conflict, immorality and breakdown of society. ~ Does that mean that the world is coming to an end? ~ Are we living in the last days as prophesied in the Bible? ~ Is Jesus Really coming back? Author Tony Pearce used to work as a school teacher in north London and is now the pastor of The Bridge Christian Fellowship. He produces the quarterly magazine, Light for the Last Days, giving up to date information on issues relating to the second coming of Christ. 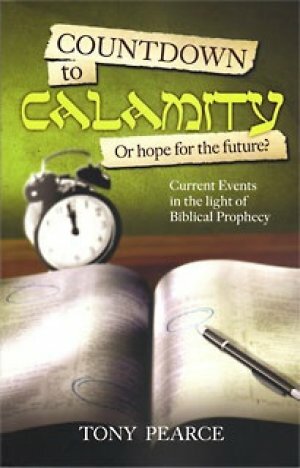 Countdown To Calamity - Or Hope For The Future by Tony Pearce was published by New Wine Press in January 2011 and is our 31046th best seller. The ISBN for Countdown To Calamity - Or Hope For The Future is 9781905991648. Be the first to review Countdown To Calamity - Or Hope For The Future! Got a question? No problem! Just click here to ask us about Countdown To Calamity - Or Hope For The Future.